My sister-in-law has just had her first novel published from Egmont USA and I’m happy to take a blog post to promote it. It’s a great book (though I’m biased) so if you are or have a young adult reader who likes fantasy novels, princesses, and kingdom intrigue…well, check it out. Book preview: Princess and heir to the throne of Thorvaldor, Nalia’s led a privileged life at court. But everything changes when it’s revealed, just after her sixteenth birthday, that she is a false princess, a stand-in for the real Nalia, who has been hidden away for her protection. Cast out with little more than the clothes on her back, the girl now called Sinda must leave behind the city of Vivaskari, her best friend, Keirnan, and the only life she’s ever known. About the Author: Eilis O’Neal is the Managing Editor of the literary magazine Nimrod International Journal. She started writing at the age of three (though the story was only four sentences long and not very good), but she hopes that she’s improved a great deal since then. She lives in Tulsa, Oklahoma, with her husband, Matt, and two dogs, Nemo and Zuul. 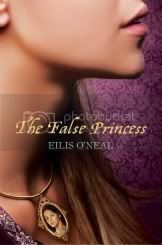 The False Princess is her first novel. You can visit her online at www.eilisoneal.com. Regular blog posts resume after this commercial. But I do hope you try it out!